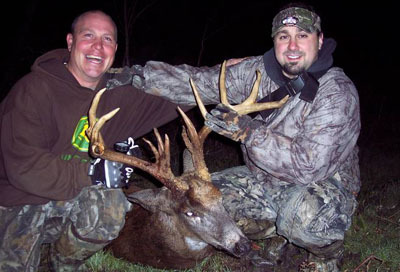 Hunting hard, thorough scouting, some advice from my wife as well as a good friend and of course with some luck, I harvested an awesome buck on Saturday, November 5th, 2011. While scouting during the spring and summer I caught some glimpses of him here and there. I also got 3 sets of trail cam pictures of him. He looked like a great buck, but I was never able to get a really good look at him. With every sighting though he was full of surprises… and he kept getting bigger every time. After hunting this buck hard all season and passing on many other bucks, I was beginning to wonder if he had vanished. I was not getting any new trail cam pictures of him and I had yet to see him while hunting. There was little evidence that he was still in the area other than some massive tracks along with the unfortunate trees that crossed his path. Then on Saturday, November 5th in the morning while I was giving the area a rest and chasing a different buck in another area, I got a call from my friend Joe who said he saw a hot doe being chased by two small bucks in the bruiser’s territory. Later that afternoon while considering where to go my wife Julie told me there is no choice, hunt the hot doe and see if this bruiser I had been after all season was going to tolerate two other subordinate bucks chasing her. I headed to a stand close by where I thought they bedded for the day and even though I knew he was mostly nocturnal, the one thing I had going for me was that this was PRIME TIME to kill a buck of this caliber. An hour prior to sundown I began hearing some deer get up from their beds. Shortly after, I heard some thrashing and a doe ran right under my tree stand. Next I heard a series of short grunts and a half rack 8-point buck hot on her trail came by my stand. Just when I thought that could be it, four deep tending grunts came from the same direction. I caught a brief glimpse of a rack and thought that it was probably one of the other bucks I had been seeing. Nonetheless, instinct took over and I knew it was time to grab my bow. After what seemed like an eternity and hearing the buck shuffle through some thick stuff, I saw some other does moving around. Then I heard another set of deep grunts, and spotted the buck. He started running perpendicular to me, taking a line that would present an ideal shot opportunity from a tree stand that was almost never hung this season. In a flash I saw the frame of the rack, my eyes could not believe it but my mind began focusing on the next 10 seconds that would make or break my season. I immediately shifted my focus off of the rack and to where the moment of truth was going to take place … the shot set-up. The buck stopped at 17 yards quartering towards me with his head behind a tree. I mentally advanced his position and saw where the shot was going to take place assuming his current trajectory and intention of getting back on the hot doe’s trail. I drew my "Invasion" bow and took a deep breath as he took the next five critical steps to get back on the trail of the hot doe, stepping right into my shooting lane. I executed my shot. As an avid bow hunter, I saw what I wanted … an impressive frame running away in swift fashion, tail down and a wound from my Rage broadhead right where it should be... all after a 15 yard shot. Then I heard some splashing in the swamp, a crash and then nothing. Two more doe ran through and the only thing I could hear was the pounding of my heart. I quickly called by wife, father, and best friends to explain what happened. As I retold the same story in milliseconds, I knew sunlight was fading and it was time to go get my arrow to assess the shot. After a quick search I could not find my arrow, but saw some good initial signs of a solid hit. Even though I heard a crash and felt good about the shot, I began second guessing the situation and after consulting with some good friends I backed out and waited a few hours. My good friend Scott and his wife both came over and we headed out with the intention that at the first sign of a questionable blood trail we would return in the morning. Upon arrival to the location, what seemed like an excellent shot was quickly turning into my worst nightmare. We were finding very little blood as he headed into the swamp. I quickly began to panic and started contemplating coming back in the morning. Looking for blood trails at night is difficult and as his wife was standing at the last sign of blood Scott and I spread out to look for more sign. Then, Scott called out to me that he had found some more blood. When I got to himn he asked me to put my right hand out. As I extended it, without really knowing why, he grabbed my hand and shook it while pointing the light to a deer laying in the swamp right where I had heard the crash. From that vantage point we could only see the body, but as we began to approach him we were both amazed to see the bruiser up close. There he laid 70 yards from where I shot him. A massive 15-point buck that was double lunged. He was wide, he had unbelievable mass throughout his rack and both sides had TRIPLE brow tines – just an unbelievable animal. We went CRAZY... high fives, phone calls, pictures, just an awesome night to remember forever. Eventually Scott and his wife went back to get the ATV’s and I was left with this buck of a lifetime and all could think of was how honored I was to harvest him. After we got him back to my house my wife came out to congratulate me, admire him and of course get some credit for her advice. It was well into the night after everyone left and I do not think I was able to sleep more than 30 minutes. The next day was a whirlwind of visitors with more pictures and stories. Later that day I brought him to the taxidermist who was there when we pulled him out and he was aged at 6.5 years old. He was estimated to weigh well over 200lbs. 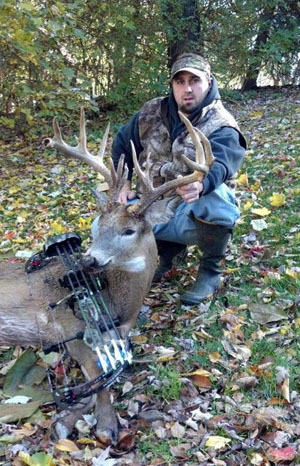 He has triple brow tines on both sides and has a total of 15 scoreable points plus two "kickers" that were less than an inch – one kicker off his G3 on the left side and the start of a drop tine on the same side. A couple days later my brother Jason had a local official scorer come over to green score the rack. A buck that went from a possible shooter, to a 130-140 class buck after some trail cam pictures and then to "somewhere in the 160’s"... after we walked up on him continued to surprise as the large non-typical grossed 183+inches. This includes a 4.5 inch deduction from a run-in with Blowflies over the summer who laid their eggs on the tip of his right main beam causing a unique hole like structure and in the score books a deduction that would prevent him netting into the 180’s. After the 60 day drying period I will have him officially scored. Regardless of the score though, he is the most impressive animal I have ever laid eyes on and my largest buck to date. I could not be prouder or consider myself more fortunate than to harvest this animal. I am also incredibly blessed to have the most supportive wife, a father who introduced me to hunting, a great family and the best set of friends.